Spring is in the air, the sunshine is slowly starting to make an appearance and people are considering spring cleaning their homes. But what about their businesses? 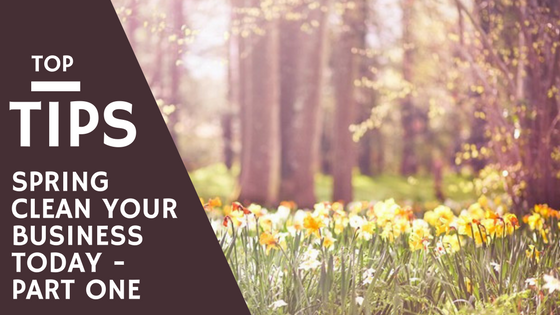 Spring brings to mind the thought of renewal and clearing away the old for new growth, and with the first quarter of the year nearly behind us now is the best time to start taking a look at your business, and consider what needs cleaning. In this blog post I will walk you through the different aspects of your business that you may have left unattended for some time without realising it. Let’s take a look at what you currently have going on through an audit. Not a financial audit, which is the first thing many people think of when hearing the word, but a business audit. Looking at what is and isn’t working for your business. It requires the use of spreadsheets and some time to sift through everything but the end results is an organized, on brand business. In order to start cleansing your business you need to understand where it currently stands. Start with your most public representation – YOUR BRAND. Your brand raises awareness, credibility and touches every aspect of your business. If one aspect is out of sync it could be costing you clients every month. Start with a list of all the areas your brand is seen. Not just social media and your website, but directories, Google, and your business materials. Is your logo/profile image consistent throughout all avenues? If you have a different logo for printed materials, is it still relatable to your online presence? Are the headers and other imagery consistent across profiles and your website? Does your bios, descriptions, and business stories match? Is there any details you could now add? Is the content written to match the personality of the platform while still allowing your personality to shine through? Do you really need all those newsletters, and sales emails coming through? Consider when was the last time you opened them. Does your email signature let people know what they need about you? Once you answer these questions you can start looking at what needs changing. If you have answered ‘No’ to majority of these questions, then it is time to consider what is working for you and what needs updating. Take a look at your insights from social media, email marketing and Google analytics. Assess how often you are posting to each platform, and the results you have achieved from this. Pay close attention to which type of content is resonating with your audience more, this will be an area of focus when making improvements.Keep a list of everything you have audited for future reference. Sign up to my newsletter below and receive a free audit checklist to get you started. Does it resonate with your goals and brand? Once you have your audit in place you can compare it to what you want for your brand, and your overall business goal – including your desired audience. You set a goal of being a fun loving, family brand that helps other families with their services/products Can your audience see this and feel this through your content? Once you know whether you are achieving your goal, and on target with your branding you can tighten your focus, make creating plans easier and organise your brand easier. Providing a professional and organised front to your audience. Even if in reality, your office looks like it has been hit by a tornado! Join us next time to see what to do now you have audited your business as we work through each aspect and start improving your consistency and organization.